Chance the Rapper visited Chicago’s WGN Morning News show to discuss his nonprofit’s partnership with the station’s annual holiday toy drive. While on set, Chance subbed in for the meteorologist and delivered the weekend’s weather forecast. 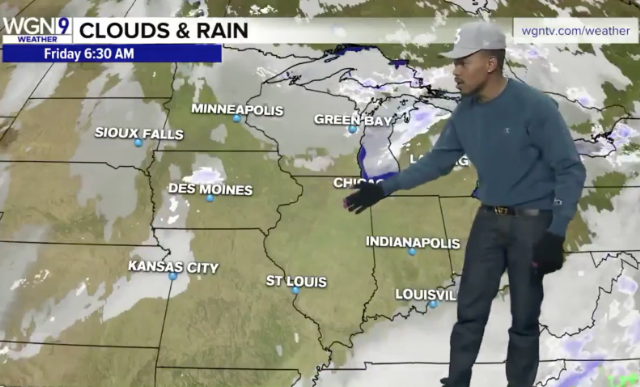 The rapper read the morning temperatures (20 degrees in Chicago), joked about every snowflake being unique (prompting an odd joke from an off-camera broadcaster, “And they all matter!”), and donned a green “invisibility” jacket to play with the green screen. He seems to have had a good time. You can watch the segment below.